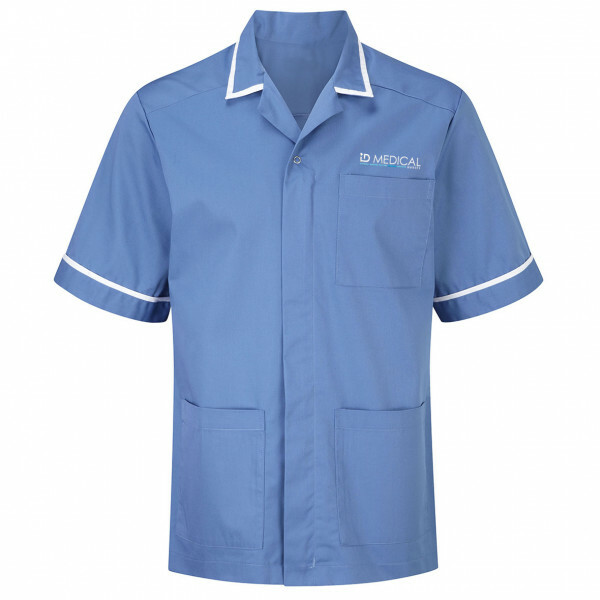 ID Medical branded male tunic in mid-blue for Registered General Nurses (RGNs). Material: Polyester/Cotton. Buy 2 for only £35 (discount is applied at checkout). There may be exceptions to the above; this will depend on the environment you may be working in e.g. Theaters, Specific Wards, and or Homes etc. This list is not an exhaustive one. Do not wear jewellery whilst on assignment. Always wear a clean, presentable uniform. Wear closed toed, flat sensible shoes. You are to maintain your uniform accordingly and request replacement or exchange whenever the need arises. You are to report any loss or damage to your uniform as soon as reasonably possible, and before any assignment. You are never to wear or use your ID Medical uniform for any other purpose other than works pertaining to ID Medical business. By purchasing a uniform from this website you are confirming that you have read and fully understand that if you do not follow the above requirements on work-wear and attending assignments, this may be in breach of ID Medicals contractual and or legal requirements and any known breach may result in disciplinary action being taken against you. ID Medical ensures that all its workers adhere to contractual and legal requirements at all times. If at any time you need clarification you will endeavor to contact your immediate ID Medical line manager.